What Is the iPad's Lost Mode? The iPad is an extremely secure device. Not only is it impervious to traditional viruses, but the app store also helps prevent malware. The newest iPads even let you unlock your device with your fingerprint. But what if you lose your iPad? Or worse, what if it is stolen? You can find your iPad using the aptly named Find My iPad, and one cool feature of it is Lost Mode, which locks down your device and can even display a custom message with your phone number so you can be contacted to return the device. Lost Mode allows you to lock the device with a passcode. This means anyone attempting to use the device will be asked to put in a 6 digit code before the iPad can be used. It will also disable all text messages, phone calls, notifications, alerts, alarms, events or any other personal message. Lost Mode also disables Apple Pay. In essence, the only thing the iPad will be good for when Lost Mode is enabled is displaying the custom message you choose to put on the screen. In order to use Lost Mode, you will need to have Find My iPad turned on. This feature allows you to track your iPad's location and turn on the Lost Mode no matter where your iPad is located. You can turn on Find My iPad in your iPad's settings. The iCloud settings have moved into the account settings, which can be accessed by choosing your account (usually your name) at the very top of settings. On any PC, tablet or smartphone, go to www.icloud.com in a web browser. This will allow you to sign in to your iCloud account. Next, simply click Find My iPhone to receive a list of devices with their location highlighted on a map. 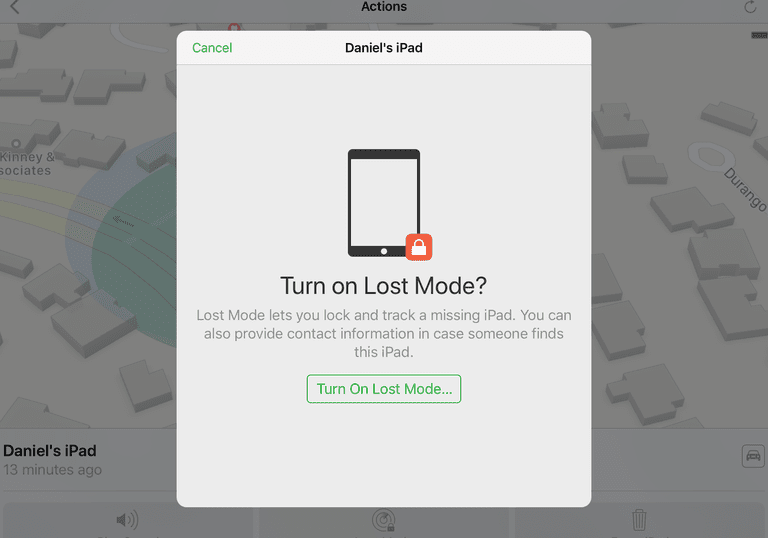 If the iPad cannot be found or if the iPad is located somewhere outside of your house, especially if it is in a public place like a store or restaurant, you may want to activate Lost Mode if for no other reason than to make sure the iPad is safely locked until you can retrieve it. As above, navigate to Find My iPhone either through iCloud on a web browser or on another iPhone or iPad. Tap on the iPad that is lost to activate it on the screen. At the bottom of the screen is the Lost Mode button. After you tap it, you will be asked for three things: (1) a 6-digit passcode to lock it, (2) an optional phone number where you can be reached and (3) an optional message to display alongside the phone number. The passcode is the only one that is required, and you will need to enter this code again once the iPad is located in order to unlock it from Lost Mode. You can also force your iPad to play a sound from this screen. The Play Sound button will activate a sound from your iPad, which is useful if your iPad is lost under a couch cushion or hiding under a bed sheet. Should you erase the data on the iPad? If you don't recognize the location, your iPad may be stolen. However, Lost Mode will both lock it with a passcode and disable Apple Pay, which does a good job of protecting the device. If you have saved more sensitive data on the device and backup your iPad on a regular basis, erasing the iPad might be the best choice. You can do this by tapping the Erase iPad button in the Find My iPad app or website while your iPad is highlighted. Note: The Find My iPad features can only work if the iPad is connected to the Internet, whether by a 4G data connection or by connecting to a Wi-Fi network. However, even if it isn't connected, any commands you give it will be enabled immediately after it connects to the Internet. For example, if your iPad is stolen and the thief tries to use it to browse the web, your Lost Mode or Erase iPad will carry out as soon as the iPad connects to the Internet. But I Don't Have "Find My iPad" Turned On! If you have lost your iPad and don't have the Find My iPad Feature turned on, you will not be able to use Lost Mode. You may also want to change the password for your Apple ID to prevent any unwanted purchases, especially if you don't have your iPad locked with a passcode or if it has an easily guessed passcode such as "1234." If you think the iPad was stolen, you should report it to the police. If you have registered your device with Apple, you can find your serial number at supportprofile.apple.com, otherwise, you can find this information on the iPad's box.